Wow! Look at all the surrounding trees! I would be willing to bet money that only about 10% of the trees in that picture remain now. Lenox Square is now right in the Buckhead area of Atlanta and it surrounded by high-rise condos, lofts, swanky hotels and other local shops and businesses. About 15 years ago Lenox started doing some renovations and additions and it is now one of two very upscale malls in Atlanta, although this one boasts more designer/couture style shops than the other. I'd love to jump in that pic and see what was there way back then. To stroll through Rich's just once more...ah, what bliss!!! I don't think you can even see these remains in the current Lenox ...it is massive and surrounded by parking decks. That great old Rich's (white building on the top right) is now Macy's. The tan one in bottom left used to be Davison's, then Macy's, now Bloomingdale's. Just to the top of it now is a Neiman-Marcus. This has always been one of my favorite places. PS... Phipps Plaza, which sits just across the street at the top of photo (Peachtree Rd) and alittle to the right, does not even exist yet. It is home to Saks, Parisian and a new Nordstrom which rebuilt at the old Lord & Taylor site. The photo there is looking north with Davison's at the bottom of the photo and Rich's on the upper right. Note that the mall is open-air as well. Also note the third anchor on the lower right, which is a Colonial Supermarket (later Big Star, bought out by A&P then Publix). The grocery store was torn down when the mall was expanded sometime during the 70's and 80's. 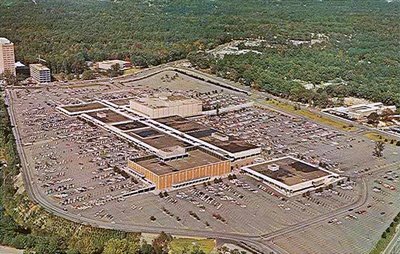 Smaller Cobb Center (the next mall built after Lenox) also had Rich's and Colonial, but no Davison's. I can only imagine the joys of being able to see that mall in the early years back when Rich's and Davison's were actually fun places to shop and weren't all merged into Macy's and malls featured more than upscale clothing stores...remember when all the old malls had a Woolworth's or McCrory's? The Bird's Eye view on Microsoft Live was AWESOME! Nearly peed my pants. I love that shot! Lenox Square is even better even closer close up. Oh my god! On that bird's eye view shot you can even see part of the orignal (brick and concrete?) facade behind the Macy's sign!